Hate it or love it, it’s the holiday shopping season, and Amazon is not stopping at just Black Friday and Cyber Monday. 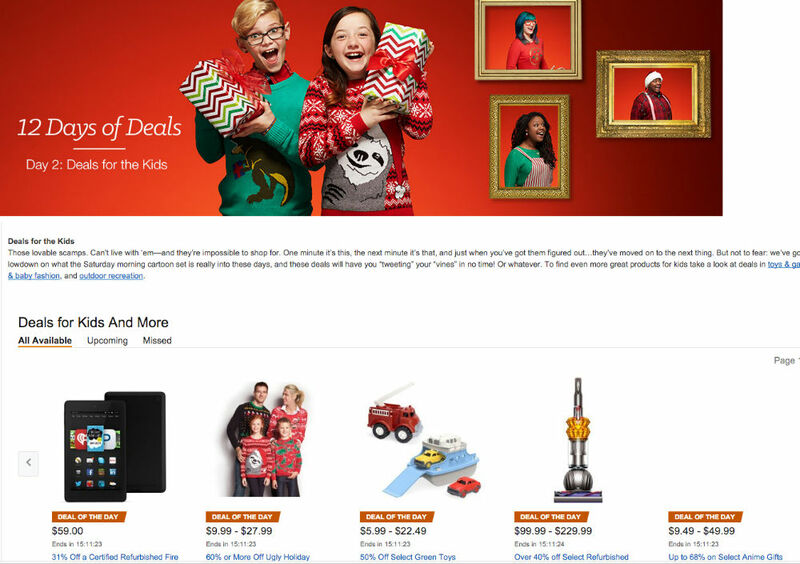 Keeping the festivities alive, now we have 12 Days of Deals, which is Amazon saying, “Yo, come spend more money right now!” Each day, Amazon will feature a theme for the deals, with today being Deals for Kids. During 12 Days of Deals, you can expect to save up to $150 on an Alienware Alpha ASM100-1580 Console, $15 off Amazon Fire TV, Nerf walkie-talkies for $12, cash off on most of Amazon’s existing Fire tablet lineup, and so, so much more. To spot these deals, you will need to stay vigilant on Amazon’s website over the next few days. On top of these specials, Amazon is still hosting their lightning deals, too. Follow the link below to start looking.